Get some Motown vibe with these live RnB drum loops! Drum Werks XIII is a massive collection of tasty Motown-inspired grooves with over 600 live drum loops ranging from 60 BPM to 150 BPM. Get the funky beats you need with a dry, gritty Motown inspired sound to match. Available in WAV, Apple Loops and Rex2 loop formats. Drum Werks XIII: Funky Motown is for all songwriters looking for R&B drum loops in tempos ranging from 60-150 BPM. The drum sounds were inspired by the timeless grooves of early Motown and James Brown, but add a bit of Funkadelic and hip-hop as well to keep the beats dynamic and fresh. With naturally crisp snare, punchy kick, and round tom sounds, the loops jump through in a clean and natural mix. If you’re after real warm and punchy drums, then the drums from Drum Werks XIII will deliver the groove. In short, you get all-natural natural sounds, an old-school drum mix, and infectious funk and soul grooves. Drum Werks XIII is pure rhythmic inspiration. 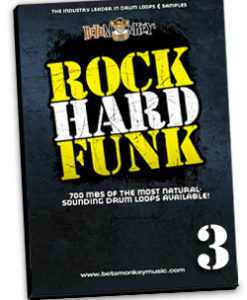 Inspire your funk drum tracks and songwriting with these old-school R&B drum loops. Not only do you get tasty sould and RnB grooves, but Drum Werks XIII features a consistent single recording session sound across the entire disc. Mixing any groove or fill from the disc is seamless. Maximum versatility and funkiness, all in one package. 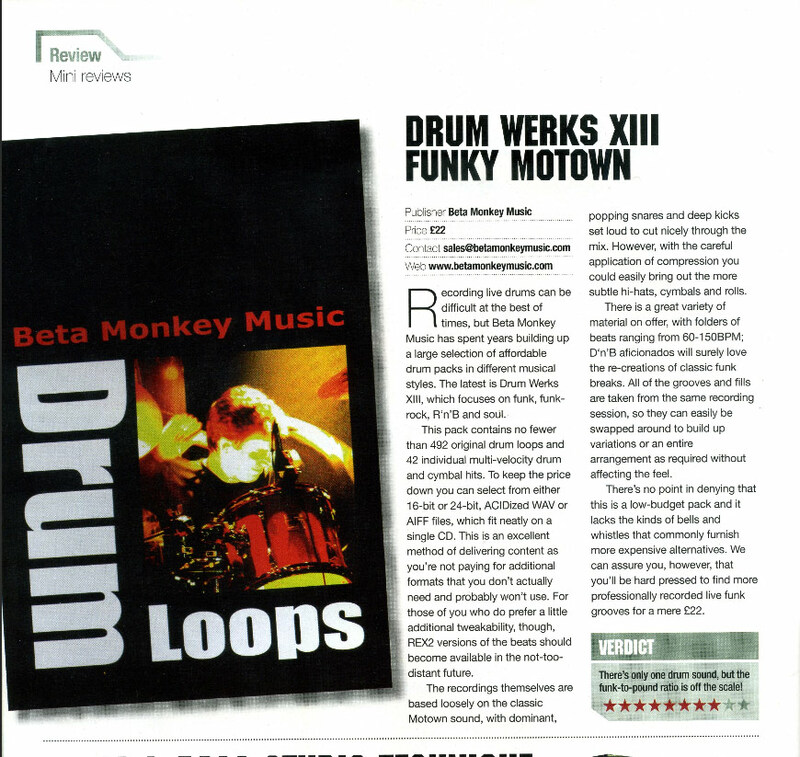 Simply put, Drum Werks XIII brings the funk and elusive feel that sits between the notes. Think your MIDI can compete with the funky essence of a live player? Can a virtual drummer really serve up the special ghost-note sauce with a side of soul to go? Ever read about those timeless Motown records and hear the terms ‘quantization’ or ‘Beat Detective’? If you answered “yes” to any of those questions, then these are not the loops for you! 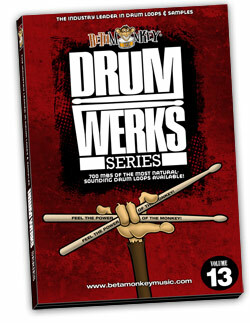 Please Note: Drum Werks XIII is a drum loops pack only. All demo tracks containing music are for illustration purposes only. Full Range of R&B, Funk, Soul Beats: Whether you need no-nonsense pop dance, half-time funk, syncopated phrasing or uptempo funk, Drum Werks XIII will keep your foot tapping and writing inspired. Groove Sets™ ranging from 60 BPM to 150 BPM will the deliver the authentic funk feels you need with a dry, gritty Motown inspired sound to match. An essential loop collection if you need to have that funk. Versatility: With seven (7) complete Groove Sets™, Drum Werks XIII covers all your songwriting needs with hundreds of old-school grooves, groove variations, fills, one shot endings and a complete multi-velocity sample kit. Cohesive Drum Sounds: We believe in maximizing the usefulness of our groove collections. As one of the first to include matching multi-velocity samples, Drum Werks XIII is a cohesive sound set with all drum loops are taken from the SAME recording session (all grooves, fills, etc., are sonically-matched). 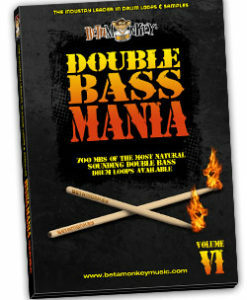 Ideal for changing tempos and feels – all drums from Drum Werks XIII will mix perfectly. Consistent sounds = maximum versatility. Matching Drum Samples Included: Build even more great grooves with a collection of all the drums and cymbals recorded on Drum Werks XIII. Or, add accents and drum part variations with the included sample set. Every drum and cymbal has been recorded, sampled, and included with this downloadable sample library. 607 (680 MB 24 bit WAV; 482 MB 16 bit WAV) original, license-free ACIDized, APPLE LOOPS/AIFF and REX2 loops. Can you handle these wicked funk grooves? Over 400 live funk loops and fills to inspire any songwriter looking for "the" groove! Takes the attitude of rock and infuse it with the syncopated rhythms of funk. Inspired by P-Funk 70's-style funk, Motown, and RnB, you'll get classic funk drum beats that hit it hard. You gotta have that funk! Multi-velocity samples are also included. Over 1000 live funk drum loops to inspire any serious funk songwriting project. Mix the improvisational mentality of jazz, the groove inventiveness of funk, and the powerful drum sounds of rock - a beautiful mix of groove experimentalism all captured and available in Rock Hard Funk. For all you Cratedigging addicts out there! Inspired by modern funk as well as vintage 70's funk groove styles, we've created a funk beats library that delivers funky groove after funky groove — an intensely musical blend of old and new school funk with hundreds of funky loops and fills to choose from. With over 800 MB of live funk, this one is for artists looking for a versatile live collection of funk beats, samples, and breaks.